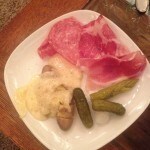 Those who follow my blog posts know by now that Raclette is my all time favorite dinner experience. I love the cozy setting, the relaxed atmosphere, and great dinner conversations with friends and family. Add a crackling fire in the background and of course the delicious melted cheese and I’m happy. 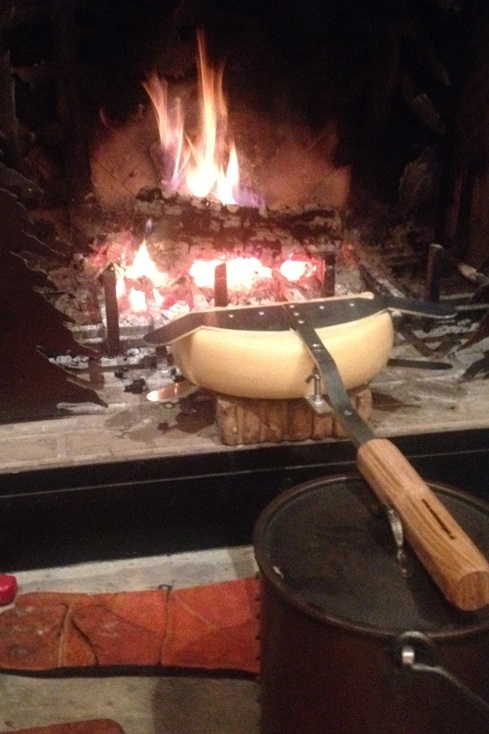 Which brings me to this post’s topic: I found a company in Switzerland that makes a holder for the raclette cheese to be placed next to the open fire. I call it the ‘Flame’. The holder is made of aluminum with a the solid wood handle for an easy and secure grip. Our friends have an open fireplace and that is where we tried it. 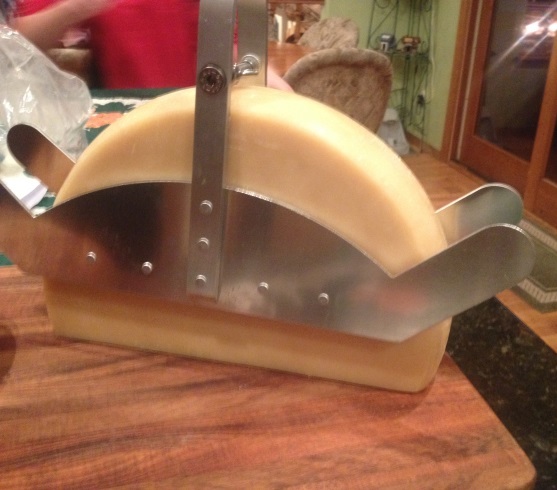 The cheese was set tightly into the holder. Instead of holding on to the handle the whole time we found a way to lay it down. When the cheese started to melt, we scraped it off the wheel onto a prepared plate. 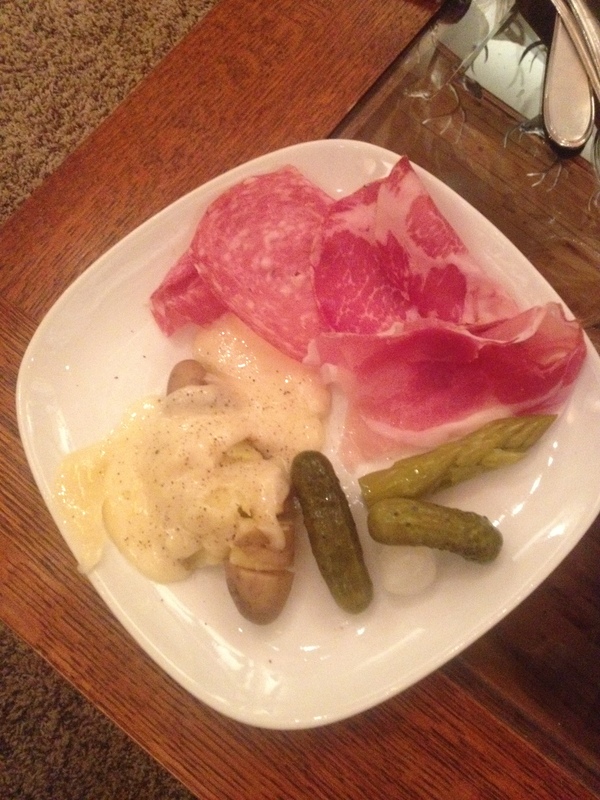 The raclette cheese was served with boiled fingerling potatoes, salami, prosciutto, and gherkins, sprinkled with my own raclette spices. The taste was absolute fantastic. Maybe it’s just the setting at the fire but I think the open flame gives the cheese a wonderful smokey flavor. 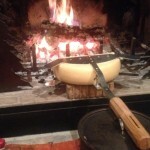 We had used the Montanella Raclette cheese, but maybe you would prefer the Swiss Emmi? 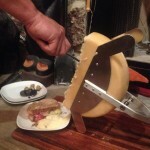 This was a true Swiss Raclette evening, only missing the traditional Swiss Buendnerfleisch, a dried meat that I didn’t have the day we had raclette. 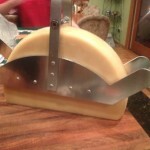 Do you have any contact information for the company in Switzerland that makes the Raclette Holder?